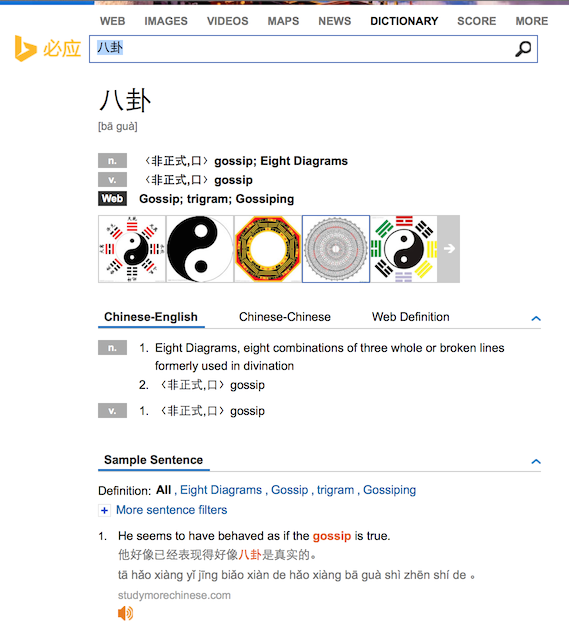 A friend of mine recently showed me a new Chinese dictionary web site that’s actually really good: Microsoft’s Bing Chinese dictionary (cn.bing.com/dict/). pinyin support for the sample sentences. I think the sample sentences are where it really shines. Quite often when using other dictionaries, I would end up getting the new word I found and searching for it on Jukuu.com to see if it’s used the way I expect (for example: to check it isn’t just literary). Bing includes sample sentences from many sources (including Jukuu). Some sample sentences have audio and/or video but these just read the sample sentence in English. Another big gripe of mine that this dictionary addresses is the grammatical parts of speech that the word can be used as. For example, it’s easy to see whether a word can be used as both a noun and a verb or only one of these.